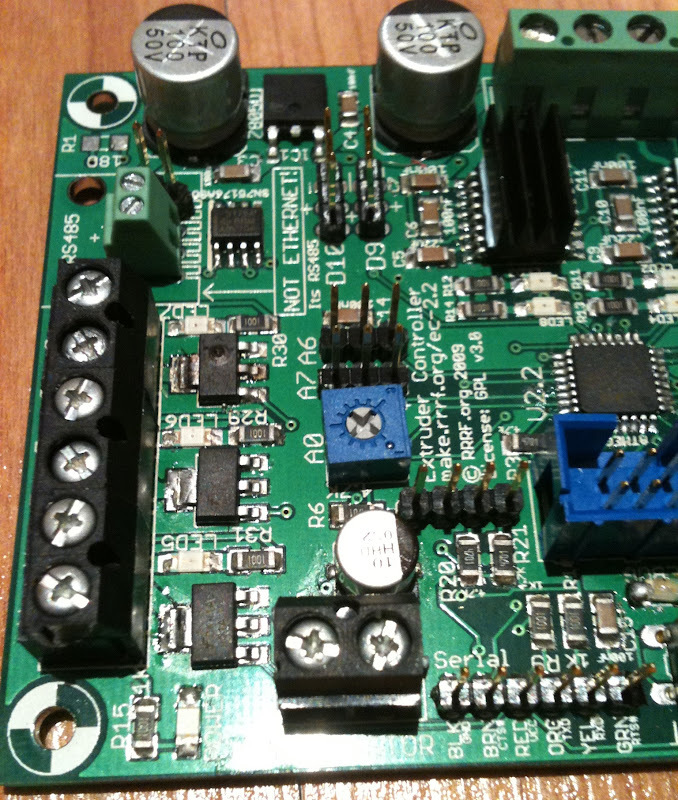 I was asked to repair an extruder controller, which I was told came from iPrint3D, where the heater MOSFET had blown. The owner said he had shorted the output and it smoked. This is odd because the device should be a NIF5003 which is completely protected against ESD, over current and over temperature so should be bomb proof. The actual parts fitted appear to be Fairchild NTD451A, which is a similar spec MOSFET, but with no protection at all. Not only will a short circuit destroy it but so will an inductive load, or simply a loose connection where there is enough stray inductance to create a tiny spark which can exceed the 30V Vds rating and punch through the gate oxide. Naked FETs are not suitable for this application. Look for "ESD Proection" because unlike a power transistor, the gate of a MOSFET is fully insulated from the rest of the device, and acts like a tiny capacitor. Even a very small static discharge can build up a huge voltage and burn through the insulation layer, destroying the whole device. Look for "internal Back EMF or Free-wheeling diode to protect the source-drain from reverse voltage when the motor stops. On the practical side, Mouser lists single quantity unprotected NTD451As for $0.70 each, and the fully protected NIF5003s for $1.39 in the same surface mount package style. So on 3 heater controls like the circuit above, you are saving $2.10 at the risk of a major meltdown! However the NTD451A has better thermal dissipation capacity than the NIF5003 and is more readily available. This means that a heated bed (like the one from Makerbot) can be run quite happily from one of these without the MOSFET overheating. At the time of production of these boards, there was a lead time on NIF5003's of 6-9months (there still is a 26week lead time at mouser)! Some times we have to take some risks to be able to produce boards timeously and hope that users don't introduce shorts in their circuits, which are pretty bad whether or not you have protection. A short to the thermistor, for example, often leads to a destroyed board too, but there is no protection there. This is the first time that this has happened to any of these boards, but this is hobby electronics and should be treated as such. I am, however, sorry that this has happened and am always fully prepared to repair or replace boards if there are electronics problems. I am more than happy to accept some advice about an alternative for the NIF5003 that would provide better protection. At the time, I struggled to find anything in the same class as the ON device. Any input is valued. It's a good idea to place a diode, in reverse bias, in parallel with inductive loads like relays and coils. The extruder heater most defiantly forms an inductive load. The extruder heater probably has a mighty inductive kick when the mosfet turns off. This could easily destroy a mosfet transistor. The diode conducts when the power is removed. This keeps inductive current confined to the inductor coil and diode until the power dissipates from the inductor. Oh, and was that NDT451A? The NIF5003 seems to be unavailable. Edited 2 time(s). Last edit at 08/10/2010 04:13PM by Nivek. Yes the circuit is designed to take a protected MOSFET, which does not need a BEMF diode or a gate resistor or ESD protection. My point is a plain MOSFET is not a direct substitute and needs all of the above and will still be totally unforgiving of a short circuit, or thermal overload. The diode surly won't protect against a short circuit. I'm just saying that a this diode is a good practice I wish I had kept to since one of mine is blown. Did anyone find a good alternative? I'm looking at BSP030 at mouser but it does not have protection circuitry. OK BUK9840-55 has ESD protection but no over current. -Hey the "on" resistance of mosfets means some devices can handle higher current even with a lower power dissipation rating. -Self-Protected mosfets seem to all be special order items. 1N4004 diode in parallel with inductive load. Edited 7 time(s). Last edit at 08/10/2010 07:37PM by Nivek. This is what I'm going to use to fix mine.